You might have noticed a dearth of blog postings lately. Along with jewelry making and filling orders this spring, I’ve been working slowly on my website as well. As of today, my blog is moving from Blogger over to WordPress, so that it can live directly on my own website instead of relying on a redirect. 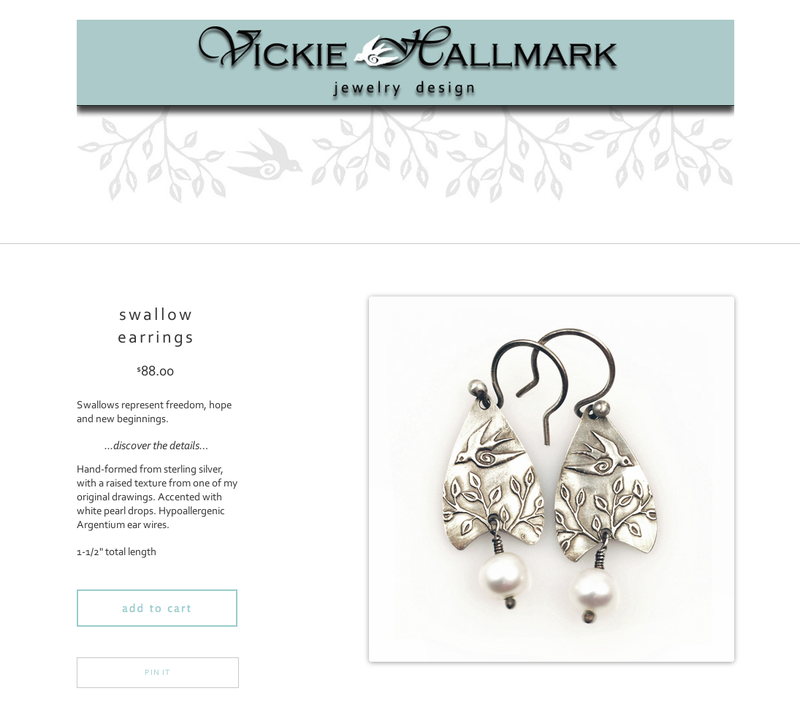 If you’re a regular (or even occasional) reader, please update your feeds while visiting Vickie Hallmark Jewelry Blog. This has been more work than expected, but I hope to make things easier in the future and have more time to show you what’s on the bench. Perhaps it was inevitable? 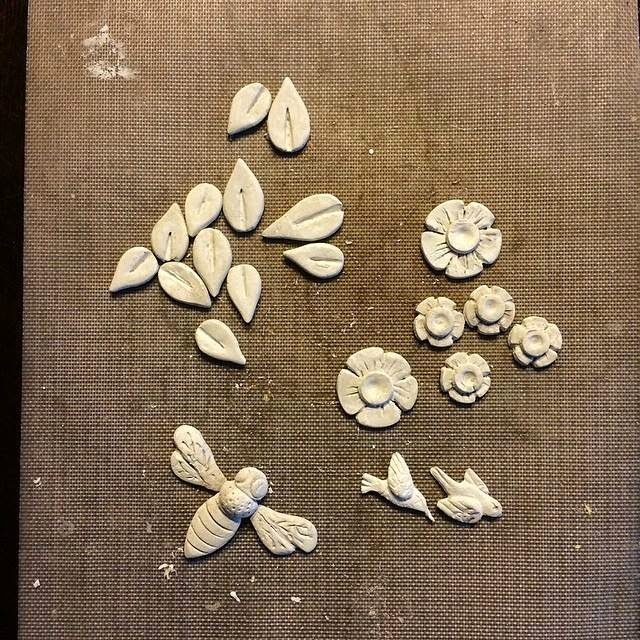 A bee joined the tiny birds and flora headed for the kiln. 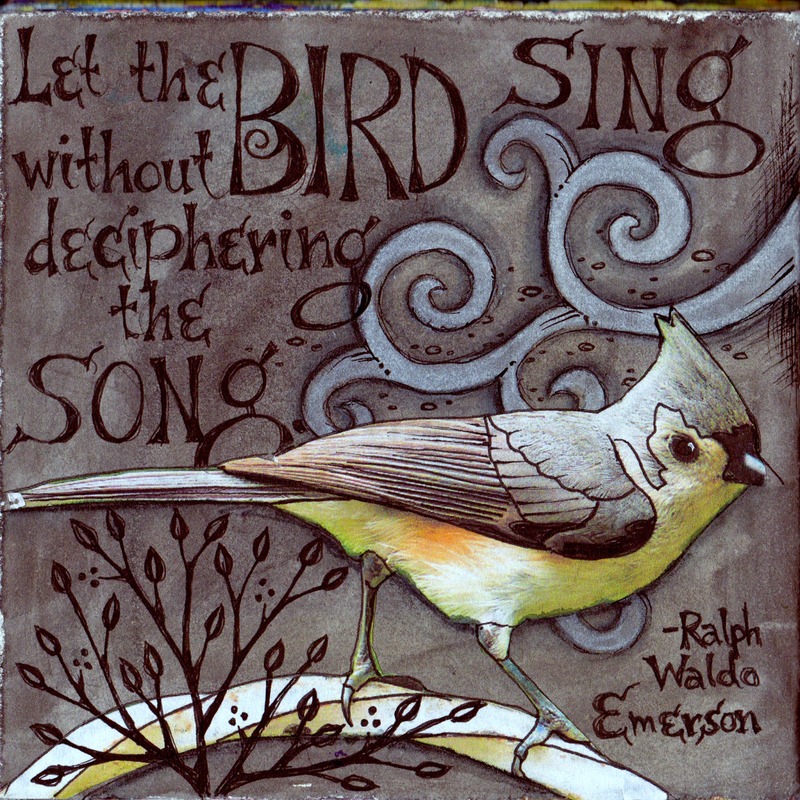 It's been ages since I worked in my bird journal, which is still available in my Etsy shop. I thought I'd revisit offering prints for the wall. So today I uploaded the back cover, one of my favorite pages, to a print on demand site to make an art print available for only $22. Matted and framed versions are also available, as well as smaller greeting cards. You can read about my process for making the journal here. See the full set of images on my website. 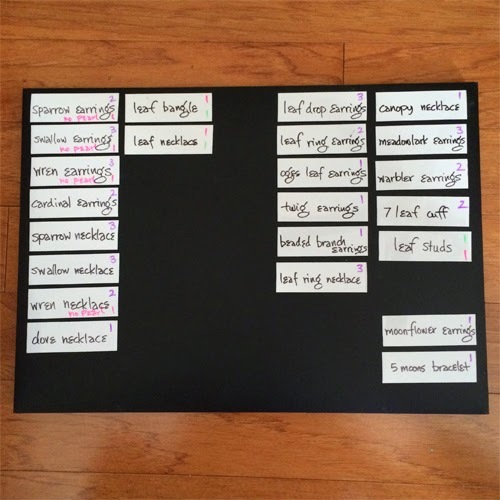 As I increase my production for galleries, I'm working on new systems in the studio to keep me organized. This is mostly a trial and error process. I tried compiling all the orders for a certain time period into a single list, at first handwritten and then input to a Word document with photos to make it visual. That at least gave me a total count when I was making a particular item. I tried printing it out and checking off items as I completed them. It was functional, but I decided that I craved some more tangible measure of progress. 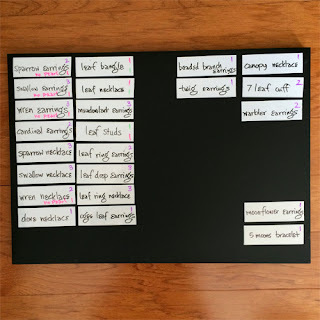 One of the home design blogs the I read, Young House Love, had a recent post on a magnetic dry erase board for organizing their home projects and blog posts. I realized that a version of their board might work nicely for my purposes. I decided to forgo their fancy customized board and just pick up something that would work. This combination of black magnetic/chalk board with white dry erase magnet strips is the result. As I play more and more with black oxidized silver, I've found myself craving gold. 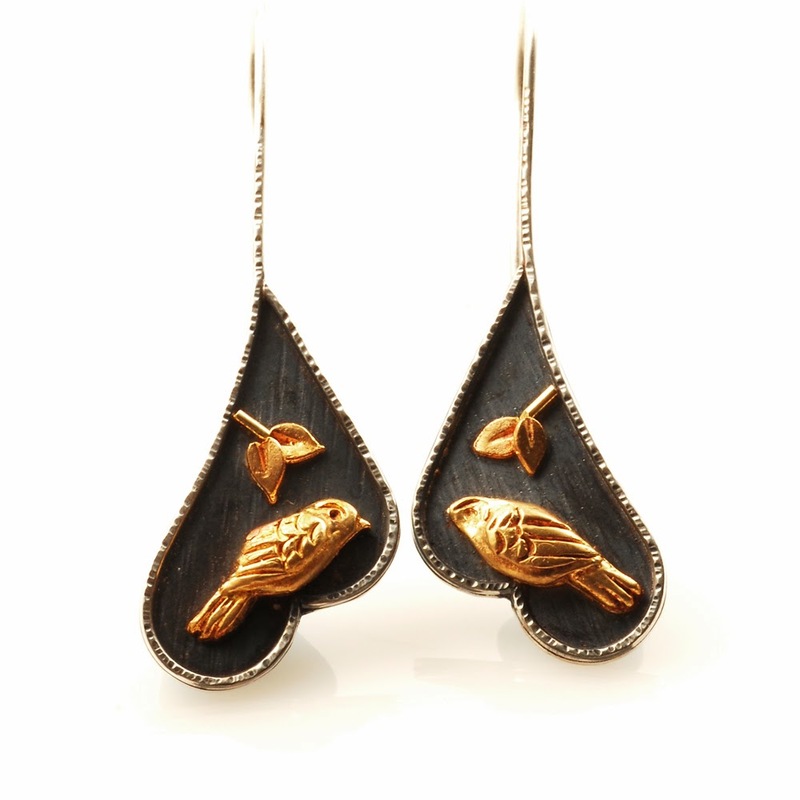 For years I've collected images of jewelry from artists that I admire which features the pop of bright gold with black. It's one of my favorite color combos. So I finally dove in. I ordered a single ounce of fine gold casting grain to combine with some unused 14k gold rings from the jewelry box to combine for 22k casting. 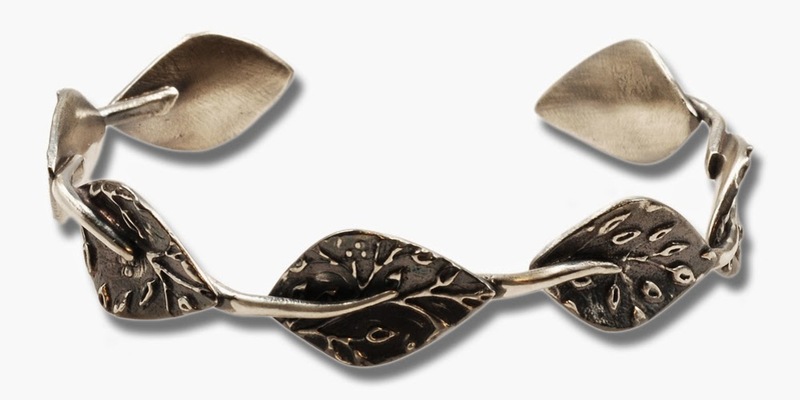 From this investment I have a collection of birds, flowers and leaves to try out in some new jewelry. Here are the first few things I tried. 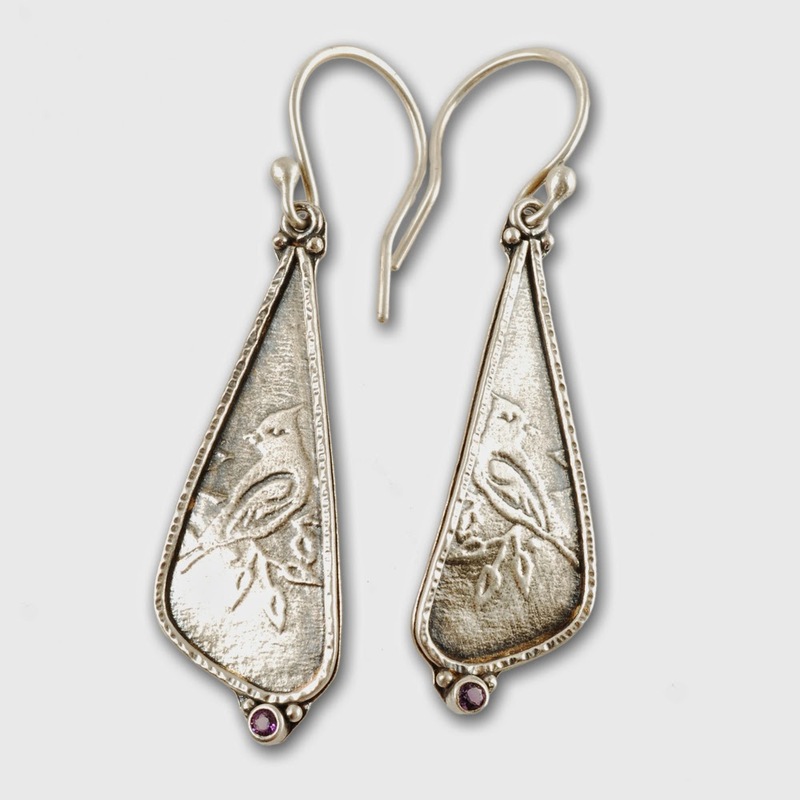 First, a simple pair of earrings with birds in the treetops, obviously goldfinches. I've learned that I need to redo my models and molds, as these gold birds are much thicker (and more expensive) than they need to be. 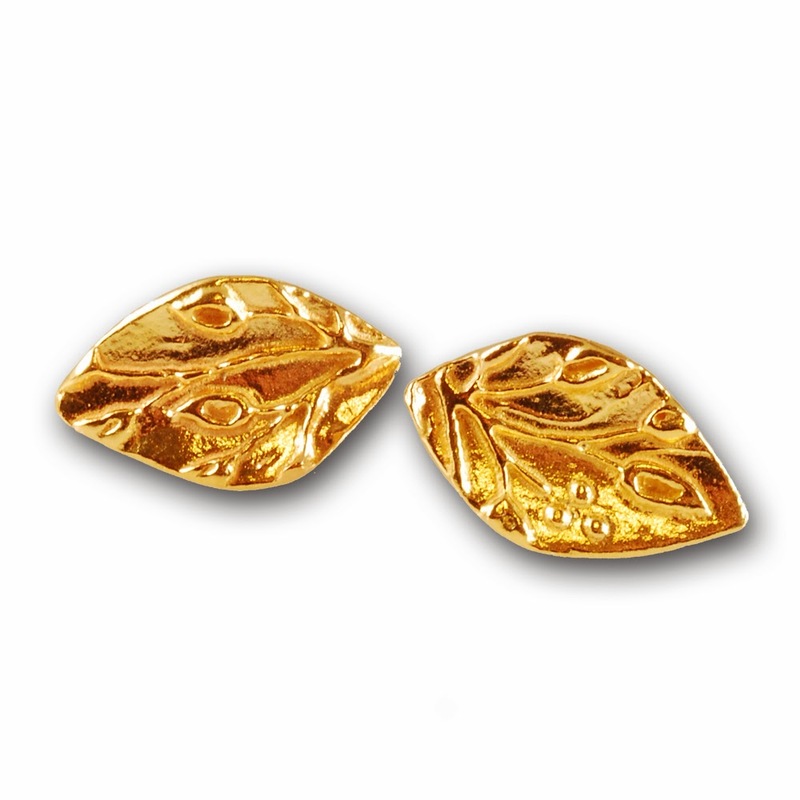 And I also made a pair of plain gold leaf studs, where I added 18k gold posts and nuts (my first time to solder gold, which went smoothly). I'm finally giving priority to getting the online shop up and running, rather than continuing to handle purchase inquiries one by one. The test shop is open, although not linked seamlessly yet, and not perfectly matched in appearance. So far, only the affordable flock collection from my jewelry line appears there. I'll be adding more just as soon as I can. I have it set up so that clicking on any individual image takes you to the shop page for that item. Please drop in to see the new shop and let me know what you think!